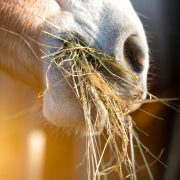 If you have a horse that suffers from Insulin Resistance, Equine Metabolic Syndrome, PSSM or Cushing’s you are always struggling to reduce the NSC levels in their hay. Some owners soak the hay to reduce the sugar levels and airborne respirable dust which naturally occur in the hay. With steaming units becoming more popular it begs the question which method is better to steam or soak? Soaking the hay in water does reduce the sugar levels, but there are a few issues that need to be addressed. First, if you soak you hay for longer than 2 hours (some will let hay soak all night to reduce feed prep) bacterial growth starts to be a problem. Secondly, soaking causes significant mineral loss, which if left unchecked can cause additional issues. If you have been soaking hay for a while, I would recommend doing an Equine Hair & Mineral Analysis. This is a comprehensive analysis of 15 nutritional elements, 8 toxic metals, 7 significant mineral ratios. From the data, you can pinpoint any mineral imbalance and correct it by creating a custom supplement. Finally, it reduces the amount of dry matter, leaving your horse with less digestible fiber. Another problem with feeding soaked hay is it is not palatable, and horses will refuse to eat it. Steaming hay does reduce the NSC levels. But it has the added benefit of maintaining the minerals. In fact, since steaming opens up the fiber matrix of hay, the bioavailability of these minerals is likely enhanced. The only mineral that decreased in concentration through steaming was iron, which is a good thing because iron increases insulin resistance. Finally, we are a proponent of providing metabolic horses a free-choice feed environment instead of a dry paddock. Steaming provides a free-choice to your overweight horse to allow for self-regulation and ultimate weight loss.